sed, short for “stream editor”, used for modifying the files in unix (or linux). At whatever point you need to change the file automatically, sed proves to be useful to do this. You can do numerous things separated from replacing content with sed. Sed doesn’t typically modify an original input file ; instead we can send contents of our file through a pipe to be processed by sed. 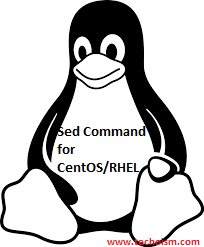 In this post we will discuss different way to use sed command. Consider the below text file as an input file. Wants to learn different operating system. linux is opensource OS. linux is free OS. linux perform task fast than windows. linuxwindows which one you choose. With sed command we replace the text in a file. windows is opensource OS. linux is free OS. windows perform task fast than windows. windowswindows which one you choose. In the above sed command we replaces the word “linux” with “windows” in the file. “s” consider files as separate rather than as a single continuous long stream. “linux” is the search pattern. “windows” is the replacement string. Use flag /g (global replacement) specifies the sed command to replace all the occurrences of the string in the line. windows is opensource OS. windows is free OS. Using too many backslashes makes the sed command typical. In this case we can change the delimiter to another character as shown in the below example. (linux) is opensource OS. linux is free OS. (linux) perform task fast than windows. (linux)windows which one you choose. (linuxlinux) is opensource OS. linux is free OS. (linuxlinux) perform task fast than windows. (linuxlinux)windows which one you choose. linuxlinuxlinux is opensource OS. linux is free OS. linuxlinuxlinux perform task fast than windows. linuxlinuxlinuxwindows which one you choose. windowslinux which one you choose. naWts to learn different operating system. nilux is opensource OS. linux is free OS. nilux perform task fast than windows. niluxwindows which one you choose. linux is opensource operating system. linux is free OS.